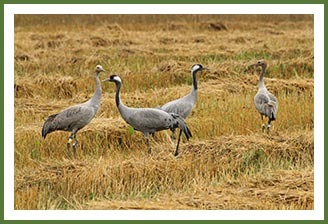 I have long been waiting and hoping for a light (22 g), rechargeable solar panel GPS-unit for cranes. In the spring of 2012 North Star developed such a unit for a leg mount. Three solar panels on the sides of the unit charge the battery enabling to store in our case 3 GPS fixes per 24-hours and transmitting the stored fixes every 3.5 days to Argos satellites. In addition to former, the unit provides information on altitude, speed and direction together with the traditional activity and temperature sensor data. 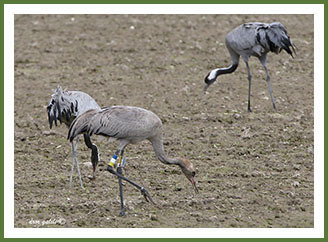 You might recall a crane colt “Outo” who was being followed as the first crane in the world from Finland to the Ethiopian wintering grounds in 2011. Since Outo’s traditional battery powered unit discharged 150 hours earlier than expected, we were not able to monitor its return from Ethiopia to Finland in the spring of 2012. Luckily, Outo’s parents managed to rear two new offspring one of which was fitted with the modern leg mount GPS-unit in the summer of 2012. 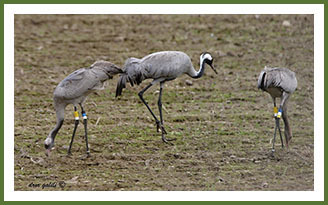 As the crane family again spent lots of time in the strawberry fields in their territory, we decided to name the crane after its favorite habitat as “Mansikka” or strawberry. Last but not least, I want to commend Janne Leppänen and Jukka Matero for their great help in capturing Mansikka and its sibling. Mansikka, just fitted with the modern 22g three-solar-panel GPS-leg mountable unit manufactured by North Star. In addition to the traditional Doppler fixes the unit provides even more accurate GPS-fixes. The estimated life time of the unit is 2-3 years. Mansikka, together with its family in Harmaasalo, Outokumpu on October 6th 2012, four days before setting off for autumn migration. Mansikka and parents in Hula, Israel on Feb. 12th 2013. 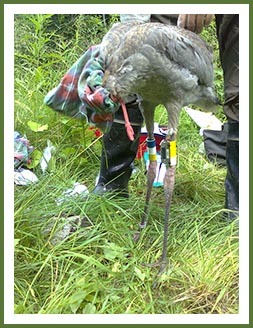 Note the solar-panel GPS-transmitter mounted on the left leg.